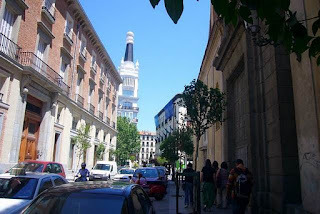 It is often difficult to find long-term rentals in Madrid. On the long term rent, most of the apartments in Madrid are not fully furnished and equipped and you will have to pay for all the bills, and contract directly with the suppliers (electricity, gas, telephone, internet connection, etc). That means that you will have to add to your rental price about 200€ per month to pay those bills. Also, you will have to pay in advance at least one month rental as a Security Deposit for the owner and other one month rental if you rent it through an agency plus the monthly fee. And, these properties are available at an affordable price that won’t break the bank. These apartments are perfect for employees who come from other countries to work for long periods in Spain. Or for expatriates relocating to Madrid and who need a quick accommodation option while they look for something more permanent. Or for students on a course not lasting the full academic year. Cozy apartment in the most fashionable area at central Madrid. Perfectly located monthly rental apartment for those who want to live at central Madrid. For a full list of our apartments in Madrid for long term stays, visit our Madrid Monthly Rentals Section in our website, where you can also book it online. If you’re not sure which apartment is best for you, please just fill in our request form and allow us to suggest the best option. We are happy to help you in finding the perfect apartment for your short, medium or long term stay in Madrid.